of the most audacious air raids of World War II. On April 18, 1942, under the leadership of Lieutenant Colonel Jimmy Doolittle, a small force of B-25 Mitchell light bombers set forth on one of the most audacious air raids of World War II. Launching, in a rough sea, from the heaving deck of the carrier USS Hornet, the crews knew that even if they achieved success, they were not to return. Their mission: to bomb Tokyo. 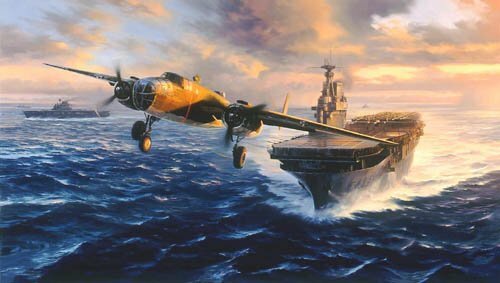 Nicolas Trudgian's stunning portrayal of Jimmy Doolittle's B-25 depicted moments after leaving the deck of the Hornet. Joining artist Nicolas Trudgian in signing this important edition are FOUR of General 'Jimmy' Doolittle's famous aircrew who took part in the historic raid on Tokyo.